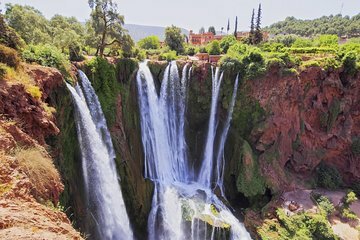 Visite las cataratas Ouzoud en un viaje de un día completo desde Marrakech y disfrute del exuberante paisaje del valle del río de montaña. Permanece en la base de las cataratas, cuyas cascadas caen 360 pies (110 metros) en una amplia cuenca, y observa cómo los monos de Berbería se balancean en los olivos que bordean las orillas. Conozca cómo la comunidad usa el poder de Ouzoud, que significa "moler grano" en Berber, para alimentar a los pequeños molinos en el precipicio de las cataratas, luego explore y almuerce cerca de las cataratas, mientras experimenta la tranquilidad del Gran Atlas de Marruecos. Our driver Abdellah was very polite although he couldn't speak English at all what made the experience a bit complicated, no problems if you're French or Arabic speaker. On arrival a guy, Joseph José or Giuseppe as he tried to be exceptionally charming - depending on your nationality came to collect us and we assumed that was contracted from the company saying that he was showing us the entrance, after explained us his tariff was 500 dirhams for having a walk with us to the bottom of the waterfalls, we answered it was too expensive for our budget and not even needed as Ouzoud is a natural park where spending a nice day seeing monkeys, Jamaican coffee shops and taking relaxing time with your travelling partners. Be aware of these cheeky guides, you don't really need one although they will try to force to get some of your bucks.